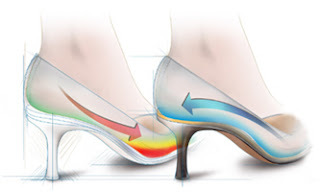 Hi, I'm the product engineer for Insolia High Heel Inserts and I have some advice. Insolia High Heel Inserts work by shifting your weight from the balls of your feet back to your heels. Because they actually work, they have sizes. The Insolia size Large fits a US Woman 10-12. My advice is, "Don't act like a guy - read the instructions!" Seriously, these are not Dr. Scholl's one size fits all. Insolia Inserts are contact lens for your feet - and placement matters. Moving them as little as 1/8th of an inch can be the difference between, "Huh?" and "Wow!". You should expect to have to reposition them 2 or 3 times to get it right. What we've learned since then is that the weight shift increases the median wear time by a factor of three. That is, one hour heels become three hour heels. The other thing we've learned is that weight shift of Insolia High Heel Inserts dramatically improves the way the wearer walks. This animation uses 3D motion capture data of the same woman walking in the same heels, with and without Insolia High Heel Inserts. Now you can walk in heels like you were born in them. Important information with a sense of humor! love it! Thanks Brian! Thanks so much for the insight. I read the reviews and saw the price (3 pairs for 19 dollars plus shipping). It was such a deal with such positive information I can't wait for your review so I just went ahead bought a set. I paid for the faster shipping, as I expect to be in heels all day long Easter Sunday! Hi Stana. I am a friend of Meg, from Northern Va. I have enjoyed reading your blog. This post was interesting. I may have to buy them too.